The talented chefs at The Watermark at East Hill love the opportunity to prepare culinary specialties directly in our dining rooms. The aromas that permeate as well as the engagement from the chefs make for such an enjoyable dining experience. 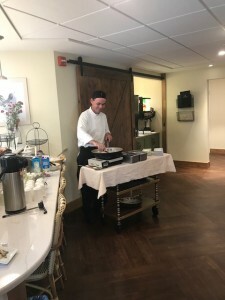 Residents residing in The Lodge at Cherrywood (our assisted living community) recently enjoyed some delicious risotto with mushrooms, asparagus, and freshly shaved Parmesan cheese prepared table side by Executive Chef, Sean. The dining room was full of laughter and smiles as well as lots of compliments about the savory dish. Chef Sean enjoyed cooking for the residents as part of our commitment to sensory dining across campus. There is a lot of excitement and curiosity about what will be prepared next!